Come together to talk about what’s working, what we need help with, and to get to know one another around a topic! Chats are scheduled for our UUAMP members as topics are raised. Become a member to join the UUAMP Facebook group and gain first access to these valuable conversations! Join us for a very special presentation on Friday, October 26th at 3:00 pm EST: "Nourishing Your Roots: How to Care for Ourselves" with Professional Massage Therapist and Reiki Master, Gina Brown. 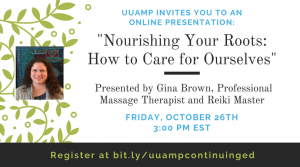 Gina earned her undergraduate Religious Studies degree from Indiana University, followed by a 13 year career in intuitive healing, spirituality, and health education. Currently, Gina is midway through a Master of Divinity degree at Drew University with a concentration in Healthcare Chaplaincy and a Certificate in the Medical Humanities. Gina is interested in hospice work, self-awareness, mindfulness, and compassionate caregiving; and exploring ways to apply interdisciplinary team and complementary and integrative treatment models used with heart, cancer, and dying patients for people in every stage of life and health.